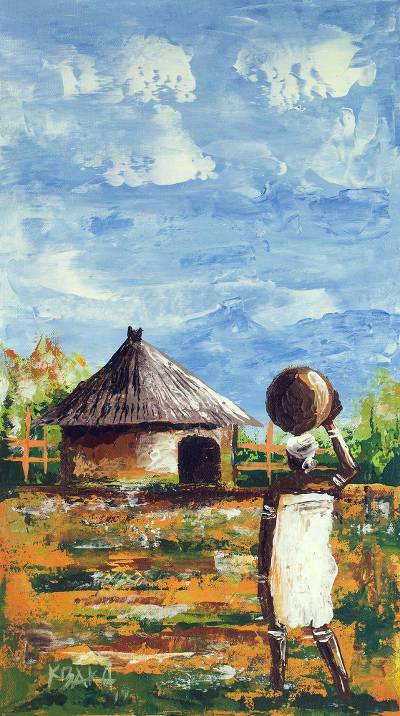 Impressionist Painting of a Village Saleswoman from Ghana, "Pito Seller"
A saleswoman clad in white walks toward a solitary hut with a pot of pito atop her head. According Ghanaian artist K. Baka, pito is a type of African beer made from millet and sorghum. He adds, "Traditional African beer tastes good." Using a palette knife, the artist paints this quotidian scene in the impressionist style.